Apple's iPad Coming March 26? Apple may ship the Wi-Fi-only version of the iPad on March 26, a little more than three weeks from now, according to the latest rumors. The new claim comes on the heels of a rumor from earlier this week that Apple had to delay the iPad launch because of "an unspecified production problem" in Apple's supply chain. Apple has yet to announce the exact dates for iPad availability, but during the iPad's unveiling in late January, Apple said the non-3G iPad would hit store shelves in 60 days, followed by the 3G model 30 days after that. Both the Examiner and MacRumors claim anonymous sources have told them the iPad will launch on March 26, possibly at 6 p.m. The rumored iPad launch timing would be similar to what Apple did in 2007, when it launched the original iPhone at 6 p.m. local time in the United States. The Examiner is also saying that customers who line up for the iPad on launch day will receive a "special gift." In preparation for the launch, Apple Store employees will reportedly get their hands on the device as early as March 10. iPad television commercials will reportedly start airing on March 15. On Monday, Canaccord Adams analyst Peter Misek predicted Apple would delay the iPad launch, due to an "unspecified production problem" with Cupertino's iPad manufacturer, Hon Hai Precision. 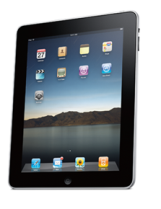 As a result, only 300,000 iPads would be ready to ship by launch date. Although Misek's claim about constrained iPad availability may be true, his analysis that Apple would delay the iPad launch has been called into question since Misek has no knowledge of internal Apple decisions. A limited stock of iPads may actually play well in Apple's favor since the company has decided to release its new tablet computer in two stages. Apple's staggered approach--releasing the Wi-Fi version first, followed by a 3G version a month later--could result in low customer turn outs for one, or both, of the product launches. Limited availability at launch, however, could drive up public demand and enthusiasm for the device. This is the second major iPad availability rumor. Last month, rumors were circulating that Apple would start taking pre-orders for the device as early as February 25.